U.S. District Judge Jose E. Martinez in Key West imposed the sentence on 40-year-old Ammon Covino, president of Idaho Aquarium in Boise and co-founder of Portland Aquarium in Oregon. Covino is also barred during two years of probation from working in a wildlife exhibit and cannot purchase or sell animals during that time. This is the latest news in a case that began back in March of 2012, when court documents say that Covino began negotiations via text messages to obtain the animals illegally. 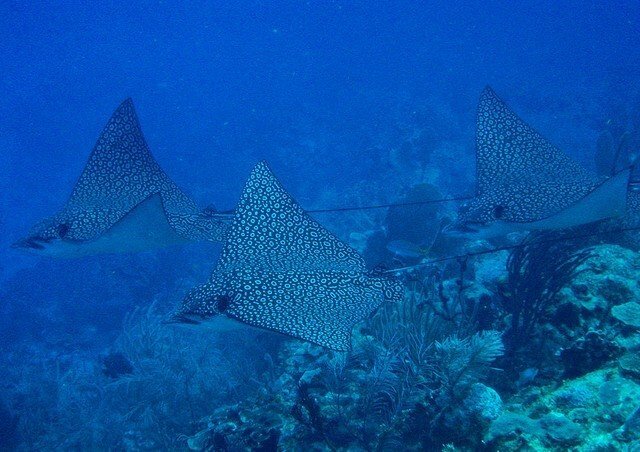 In May of 2012, the three spotted eagle rays were shipped from Miami International Airport to the aquarium in Boise, for which Covino paid $1,250 each. Then, in October of 2012, after numerous phone calls confirming the transaction, the two lemon sharks were sent on a Delta Airlines flight from Monroe County, Florida, to the Boise airport, for which Covino paid $650 each.The court called the actions a "conspiracy," as Covino was arrested along with Christopher Conk (who pleaded guilty in 2011 to selling live coral to buyers around the world), the aquarium's secretary. Conk was sentenced to four months in prison on Monday. This is the latest news in a case that began back in March of 2012, when court documents say that Covino began negotiations via text messages to obtain the animals illegally. In May of 2012, the three spotted eagle rays were shipped from Miami International Airport to the aquarium in Boise, for which Covino paid $1,250 each. Then, in October of 2012, after numerous phone calls confirming the transaction, the two lemon sharks were sent on a Delta Airlines flight from Monroe County, Florida, to the Boise airport, for which Covino paid $650 each. The court called the actions a "conspiracy," as Covino was arrested along with Christopher Conk (who pleaded guilty in 2011 to selling live coral to buyers around the world), the aquarium's secretary. Conk was sentenced to four months in prison on Monday. Court documents released today outline conversations between Covino and a person in Florida looking to sell spotted eagle rays and lemon sharks. In one conversation, Covino is accused of telling the person to sneak the fish to Idaho. Another conversation said it would be no big deal that they did not have the permits to buy the fish. Then a conversation between Covino and Conk accuse them of saying they would keep the transaction "on the down low." The crime was in violation of the Lacey Act, a U.S. conservation law that prohibits trade in wildlife, fish, and plants that have been illegally taken, transported or sold. The aquarium itself, which opened in December 2011, is facing charges for the incident as well, says the Ocala Star Banner. The aquarium itself also pleaded guilty, agreeing to pay a $10,000 fine and donate $50,000 to the National Fish and Wildlife Federation. The aquarium itself will be formally sentenced Tuesday in Key West and could face additional fines.This is far from the first blot on the controversial aquarium's record, the Idaho Statesman reports. The Idaho Humane Society is currently investigating the aquarium on charges of animal mistreatment, and in September, several former employees came forward to talk about disturbing conditions, including missing death logs, unclean tank water, and an alleged episode in which Conk placed an injured chameleon in a freezer to kill it. And in April, the U.S. Fish and Wildlife Service confiscated the aquarium's three remaining puffins because it didn't have the required federal migratory bird permit. Lastly, in September the U.S. Occupational Safety and Health Administration issued the aquarium a notice of alleged safety and health hazards for employees, including electrical issues, slipping and tripping hazards, and the use of inappropriate electrical gear in wet areas. The aquarium itself also pleaded guilty, agreeing to pay a $10,000 fine and donate $50,000 to the National Fish and Wildlife Federation. The aquarium itself will be formally sentenced Tuesday in Key West and could face additional fines. This is far from the first blot on the controversial aquarium's record, the Idaho Statesman reports. The Idaho Humane Society is currently investigating the aquarium on charges of animal mistreatment, and in September, several former employees came forward to talk about disturbing conditions, including missing death logs, unclean tank water, and an alleged episode in which Conk placed an injured chameleon in a freezer to kill it. And in April, the U.S. Fish and Wildlife Service confiscated the aquarium's three remaining puffins because it didn't have the required federal migratory bird permit. Lastly, in September the U.S. Occupational Safety and Health Administration issued the aquarium a notice of alleged safety and health hazards for employees, including electrical issues, slipping and tripping hazards, and the use of inappropriate electrical gear in wet areas.